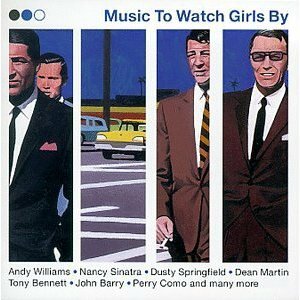 A few years ago a compilation CD was produced called “Music to Watch Girls By”. It featured classic cool stuff from the 60’s, the sort of tunes that get stuck in your head, or if you are young enough they got stuck in your parents’ heads. Music plays a really important part in my cycling. I would never ride with a music player on, but that doesn’t mean there isn’t often a song playing in my head when I ride alone, probably something I just heard on the radio or my MP3 player. Try it on a long Audax or a commute, you can lose hours.So this page is going to be the tunes store. Either the greatest tunes to ride a bike by, or the tunes that have driven me absolutely crazy, together with the story of the ride. Best tunes for riding your bike by? The original was already 3 minutes of pop perfection, but listening to this video has joyously uplifted my morning ride for three days now. My apologies to anybody in the woods near Brussels who has been terrified by a tuneless English cyclist singing out loud to the trees. Slip slinging Away – Paul Simon accompanies a snowy commute. Three new “songs of the rides” from my British Columbia Tour. I really do have very little idea how my mind works with these “Songs of the rides”. I have six days of cycling and three of them had their own theme tunes. Each song totally different in tone and origin, one just a fragment that stuck as it passed. But each is as much a memory of the day as the words and photos in the main blog. I hope you are singing as you are riding. The song buzzing through my head all day was “The Ballard of Lucy Jordan” by Marianne Faithful. Sometimes my subconscious really scares me. Just the day before I tweeted that driving or riding the Sea to Sky Highway from Vancouver to Whistler should be on anyone’s bucket list. The following day I have fixed in my mind one of the few songs that has ever been written about the things to do before you die, yet I hadn’t thought about it or heard it for years. Great song however, to accompany a great day’s riding. A single lyric popped into my head when I purchased a lifesaving breakfast at the Roadside Diner in Savona. “How to save a life”. Unfortunately I could only remember about two other lines from the song and definitely not who sang it. I would have made a very boring MP3 track, stuck on permanent repeat and it drove me crazy for the rest of the day. Of course after just a few clicks on the internet we have The Fray. Seems since a musical posting – somehow the songs just haven’t stuck in my head. Probably the rain washed them away. But not this week – pseudo Bruce Springsteens the Gaslight Anthem just stick in the brain all day. An excellent 50 miles around the Chilterns and Thames Valley, sun in the sky the whole time. Songs to ride bikes by fall into two categories for me – the smilers and the pedallers. Smilers are wistful moments, memories returning, something to accompany the joy of cycling. Pedallers are about the rhythm of riding, the tune is stomped out with the pedals. This was definitely one of those – and on some of the climbs I needed it. Route – Finchampstead, Barkham, Sindlesham, Woodley, Sonning, Dunsden Green, Henley, Lower Assendon, hard climb to Fawley, great descent into the Hambleden Valley then climb again to Frieth, Marlow, Bourne End, Bray, through the lanes to Wokingham and home. Not a song of a ride – but a song recommended by a cyclist. The Unthanks perform The Testimony of Patience Kershaw. I love the Unthanks voices anyway but i really enjoyed hearing this sone selected by Maxine Peake on Radio 6 last Friday. Click here for the blog post about the show. Otherwise enjoy the words spoken in when 1842, a commission of the British government examined the working conditions of women and children who worked in the coal mines. An illiterate girl of 17, Patience Kershaw, gave this testimony. Frank Higgins wrote her account into this powerful ballad. “Meet the Flintstones” in Vienna. Yes really. The best bike parades and critical mass events always seem to involve a mobile band of some sort. 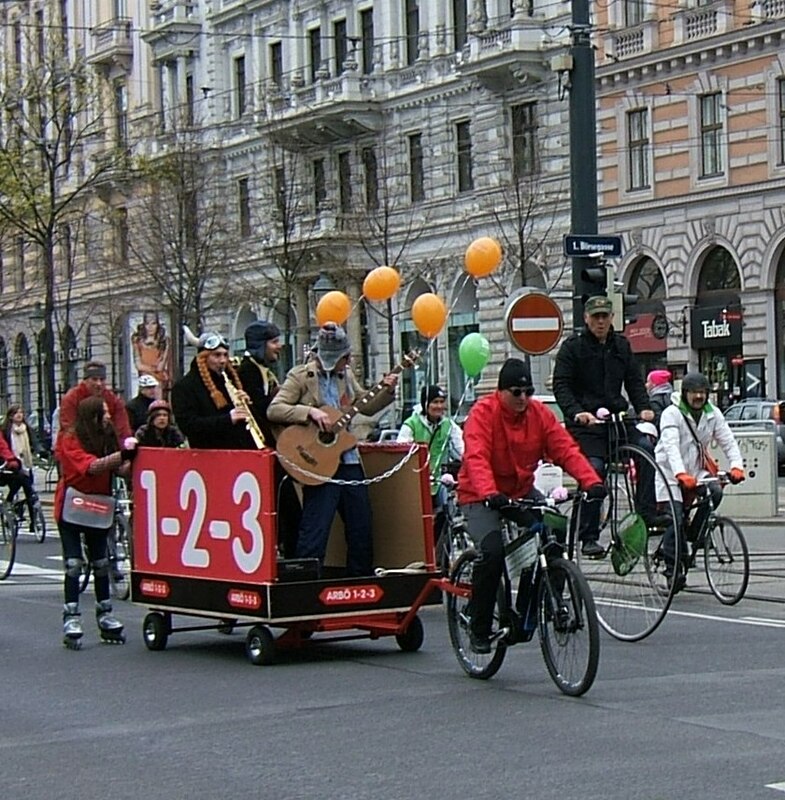 RADpaRADe in Vienna was just the same. There were several sound systems linked to cargo bikes and trailors, but these guys were the highlight, although I felt sorry for the towing rider, it wasn’t entirely flat and it showed on his face. The music was lively and varied. But of course it is the most stupid number that sticks in your mind. 30 minutes riding to “Meet the Flintstones” anyone? It could do your head in. Roll with it. After the melancholy of Whitney Houston on Tuesday I was having a relatively quiet ride in West Berkshire, out towards Silchester and Mortimer. I swung for home with a slight tail wind, upped the cadence slightly. Suddenly I’m hit by “Roll with It” by Oasis. Now this is a cycling song, there is a spring in my step and I’m crouched over the bars. Perfect – that’s one for the future, it lasted me almost 40 minutes of pedalling pleasure. Sad song for cycling A three hour ride from home into the Chiltern Hills. I was scouting out possible links from the the station at Twyford to join the Chilterns Cycleway at Henley on Thames. First decent touring ride for ages, thoroughly enjoying the warmer weather. Now I love great female vocal whether it is soul, country, folk or any of the many music forms we sum up as “world music”. This morning it was a rather sad one despite the pleasure of the ride because the song going through my head all ride was Whitney Houston, “I will always love you”, not least because of the great cover version by Jennifer Hudson at the Grammys when her death was announced. It should have been Adele that was the story of the night, another great voice, but this one’s for Whitney. Cycling music it isn’t, you really can’t stamp on the pedals to this so it was a really unusual one to pop into my head, but it was certainly stuck today. Cycling is the nearest you get to flying Tony Bennett – Fly me to the moon. Cycling to work last week this one went through my head all the way – for a whole 20 miles. For Sue and Carol, you know why. Other great cycling songs – always likely to pop up at any time. Dixie Chicks – Landslide. No idea why, but whenever I hear this it goes through my head for days. Anyhow, who can begrudge some Dixie Chicks music after they took such abuse because they spoke up against Bush and the Irag War. Admit it – you like them too!